Using mobile devices on the shop floor for workflow tracking and data collection helps your manufacturing business improve operational performance and productivity. Workflow tracking, documentation, quality control and traceability is a requirement for many industries, and it is a good practice for all manufacturers. Production process tracking, real time data collection and reporting allows you to catch deficiencies on time, identify and fix problems. You can quickly locate all affected products in case of the recall, as well as streamline warranty service and repairs. 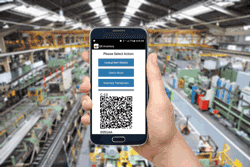 QR Mobile Data software allows you to collect data, accurately track and document production process on the shop floor in real time using mobile devices. Mobile devices (smartphones or tablets running iOS or android) are used to scan QR codes / barcodes, move products through the manufacturing process steps, collect data on the shop floor, fill out quality control forms or inspection checklists. 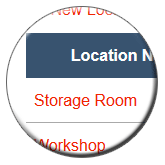 Shop floor employees can also access each product information, current status and history on the mobile device. Information collected on the mobile devices is sent to a centralized cloud location and is available to all authorized users in real time. Track products through the manufacturing process on the shop floor using mobile devices. Get real time view of all projects in progress, access detailed production history of the past projects. Create custom workflow(s) for your manufacturing process. Define workflow steps, provide instructions for each step. Create custom mobile forms for data collection and documentation, and link them to the workflow step(s). Uniquely identify each product, access detailed product information and current status. Collect necessary information (such as used equipment serial numbers, conditions such as pressure and temperature, etc.). Fill out mobile forms for process documentation. Submit all collected data to a centralized cloud location in real time. Move project to the next step of the production process. Optionally selected users can receive an e-mail alert when project is moved to the next step. Review all projects in progress: current status, production history, collected data via a web dashboard. Review life-time history of the past projects, access collected documentation. Find information that you need fast using multiple search filters. Accomodate your specific business workflow and changing operations. No matter what data you want to collect and how often do you need to adjust procedures, you can create mobile forms that fit your needs, and keep them up to date. Decide what data do you need to collect during each step of the manufacturing process, and create corresponding mobile form(s) via a web dashboard. Optionally link form(s) to the workflow step(s), so that your employees know what data to collect when. 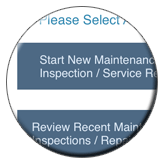 Create quality control forms and inspection checklists. Add clarifying text and / or images to make sure your employees know exactly what needs to be checked. Update mobile forms as needed, and your employees will always have current forms to fill out on their mobile devices. Divide large forms into the sections for clarity and easy completion on the mobile devices with the small screens. Create mobile forms with minimum manual entries. Include selection lists where applicable, radio buttons or checkboxes. Allow an employee to scan in value instead of entering it manually (e.g. scan in lot numbers of used components). Specify which fields are required, and each field data type. Include any number of image field(s). An employee will be able to use these fields to take photos with a smartphone, and add them to the form for visual documentation. Administrator can pre-fill part of the form before pushing it to the mobile devices. Administrators can review, and if necessary edit completed forms via a web dashboard, or fill "office only" part. Create PDF report based on the completed forms. Include images and signature. Control report look and layout using custom templates. Use smartphones, QR code / barcode scanning and mobile forms / checklists to collect necessary information and document production process. When new product batch is started, an employee can label it, scan QR code or barcode and enter all batch-related data on a smartphone. You define what data to collect and keep track of via a web dashboard. As product batch moves through the manufacturing process, an employee who performs the next step scans QR code or barcode label to identify the product batch. (S)he then retrieves relevant mobile form(s) and fill out the form for the task at hand on a smartphone. 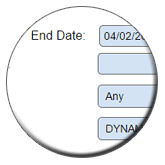 As an employee fills out a form, data are automatically saved on the mobile device. (S)he can stop and resume at any time, and be sure that collected information is not lost. An employee can use a smartphone to scan in QR code / barcodes for lot numbers and serial numbers of used parts and components. If you need to identify a production station, you can label production stations with QR codes and your employees will be able to scan them in. Any other numbers and IDs relevant to your process can be scanned in as well. Barcode scanning speeds up data collection process and minimizes a possibility of an entry error. An employee can take photos and include them as a part of the form if visual documentation is helpful or required. A supervisor or customer can sign the completed form on the mobile device before submission. Digital signature will be available in the reports. When quality control form or data entry form is completed, it is submitted to a centralized cloud location and becomes instantly available to all authorized users. Make sure your employees get all required information without delay and there are no interruptions in the production process. An employee can access all entered information on the product batch he is working with. He can update this information on a smartphone if needed. For example, he can update measurements, take additional photos, etc. 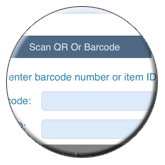 An employee can scan QR code / barcode label on a product batch to access all previous records (production steps, what was done, quality control forms). He can then use this information for planning the next production steps. Make sure you know what do you have in stock, and never run out of inventory. 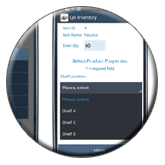 Track inventory in multiple locations with a smartphone. Process inventory transactions as they happen, on site by scanning QR code / barcode label. Access real time inventory stock, in the field on a smartphone and in the office via a web dashboard. 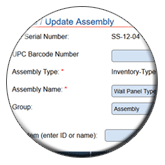 MISys manufacturing software integration allows you to send inventory data collected on the shop floor in real time to MISys Manufacturing. Access production process documentation in real time and quickly find required information. All collected data on the manufacturing production process, product batches and quality control are stored in a secure, centralized cloud location. Authorized employees can access process status and documentation from anywhere in real time. Administrators and managers can search records by multiple parameters to find exact information they need. Find information on the specific production batch: batch information, data collected during each production step, quality control forms that were filled out, what components and parts were used. Find how this production batch was distributed to the clients, and / or where it is stored. Find all product batches that have a specific component, went through a specific procedure, production station, were produced on a specific date, etc. Review, and if necessary edit submitted forms. Review projects in progress, what step they are in, and the entire production history of the current and past projects. Learn how other companies use QR Mobile Data to improve operations efficiency, track production process in real time on the shop floor, have up-to-the-minute insights into the projects progress, and keep accurate digital documentation accessible to all authorized users. Ionex Research Corporation, a manufacturer of high-performance process filtration and treatment equipment, uses QR Mobile Data / QR Inventory combo for tracking production process, quality control and documentation. Ionex employees use regular smartphones to collect data, fill out mobile forms, track inventory with barcode scanning and look up information in real time on the shop floor. The result is increased operations efficiency, improved intra-company communications and accurate documentation accessible to authorized employees from anywhere.